A Christian woman in Pakistan was beaten and gang-raped in front of her five children by a Muslim man seeking to avenge his family's "honor," because the woman's sister fell in love and fled with the man's brother. Christian lawyer Aneeqa M. Anthony, coordinator of the NGO "the Voice Society," shared news about the attack with Fides News Agency, revealing that it took place last week in Lahore. Anthony explained that the Muslim brother and a group of other men went to the home of Christian woman Samrah Badal to ask for news about the couple, but Badal refused to say anything. As a consequence she was stripped naked and dragged out on the streets, where she was raped in front of her five children. The lawyer noted that the Muslim man who escaped with the Christian girl came from a very influential family in the city, which was part of the reason for his brother seeking revenge. Anthony called on Christian politicians to do everything they can to intervene on behalf of Christians, fearing that the attack, like many others, might go unpunished by police. 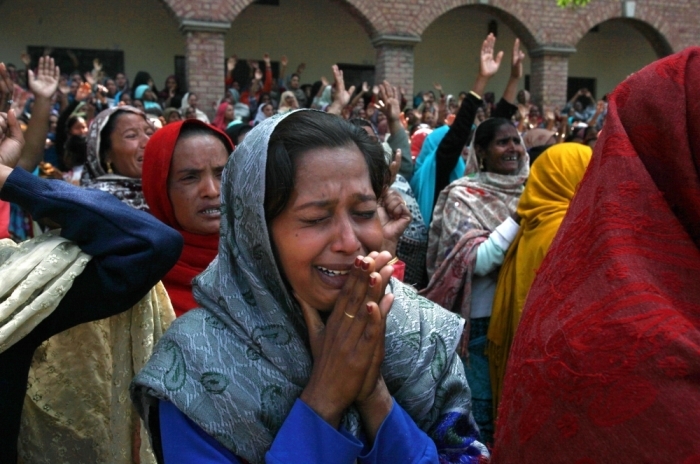 Violence against Christians continues to be high in Pakistan, and sometimes attacks are committed by members of their own family. Back in June a Christian man reportedly beat his sister to death because he disapproved of the man she was going to marry. Christians participating in honor killings is quite rare, however, according to International Christian Concern's Regional Manager for South Asia William Stark. "After hearing about this killing, I called a contact of mine in Pakistan and asked him about it. He said that it was the first time he had heard of a 'Christian honor killing' in Pakistan in his 14 years working as a human rights activist," Stark told The Christian Post in an email at the time. "Overall, Christians do not follow the practice of honor killing in Pakistan, which is why this killing is so shocking." In a separate incident also in June, a Muslim mother killed her teenage daughter by burning her to death because she married without consent and shamed the family. It was the third such crime in the space of a month in Pakistan. The girl, 18-year-old Zeenat Rafiq, was reportedly punished for marrying a man that her family had forbidden her from choosing, and had gone to live with his family. "When she told her parents about us, they beat her so severely she was bleeding from her mouth and nose," Hassan Khan, the husband, told BBC Urdu. "Her family lured her back, promising reconciliation and a proper wedding reception. She was afraid, she said 'they are not going to spare me.' She didn't want to go but my family convinced her. How were we to know they would kill her like this?"